Justice Society of America - Earth-2:Society #15 - Marking Time. Subj: Earth-2:Society #15 - Marking Time. If there was one title out there on the marketplace that might be selected to be a chronic and unrecognised underperformer of a title then DC Comics' Earth-2' brand would be the winner of the search - by a substantial margin. Eminently suited for work on DCs golden-age legacy James Robinson now works for Marvel Comics, so too does his talented successor on the title, Tom Taylor. Two gifted writers given short shrift, thus supporting the suspicion that Earth-2 as a title is a profoundly unloved and problematic stepchild for the publisher as parent. And into this miasma of apathy steps the latest writer in a long procession in the form of Dan Abnett - the go to man for books in the critical wing and not long for the schedules. 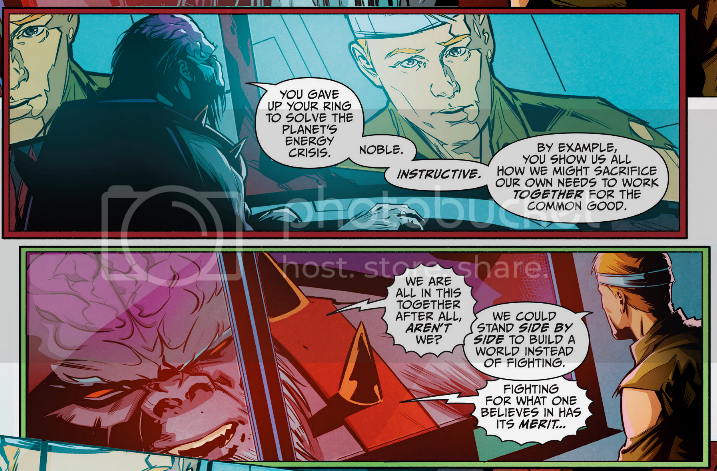 And if any one issue exemplified the futility of the current series of Earth-2 then this months installment is it. From out of nowhere the... group of heroes with no name.... have come under attack from The Ulta-Humanite. The Humanite it appears is known to at least Alan Scott, even though we have never had any hint of his existence this bizarre apelike figure somehow stowed away on one of the arks from the original homeworld unnoticed and has done very well for himself upon arriving on the new world, rebuilding a criminal base and taking the superpowered Amazon children under his influence. If this sounds stretched in credibility it is multiplied in scope for those of us who have followed the series these last four years. None of this makes much sense. And it is all but impossible to care anymore. I can't lay blame at Dan Abnett's feet for any of this, as this is the impossible format he inherited and he has the unenviable task of trying to inject a sense of movement and reality into a setting that had none to offer in the first place. The idea to show this new world as lacking in resources and refashion its narrative as a political and ecological dillema is commendable, but Abnett lacks the skill to actually address and examine the questions he poses. Last time he had Alan Scott surrender his Power Ring in order to serve the struggling society around him, a sacrifice that was also a gesture to restore confidence in his fellow supermen. This issue that satisfying resolution is undone as the Ultra-Humanite uses Scott as a puppet to recover the Pandora Box, thus we see that nothing on this worlds stage is at all progressive and events are doomed to repeat in a cycle. This is a narrative with nowhere to go. No progress, no point. A book that looks and feels a pointless exercise. It has nowhere to go, and no support from its publisher. Maddeningly though this is not how it was introduced to us... no, not at all.